My husband Harry and I had been desiring a Baba Murti for quite some time, but it wasn't until a little orange cat mysteriously showed up on the first night of Navaratri, that the energy shifted in a very big way to bring Baba to us. He was a very unusual cat for sure. Our 6 year old nephew Donovan said we should name him Christmas Tree. A very odd name indeed so I curiously asked why. He said it was because he was "all bright and shiny like the star on the Christmas Tree". It truly seems that Baba's swift journey to us began with the gift of Christmas Tree; Baba would arrive in less than 3 months. Ironically, Baba was due to arrive just before Christmas, but of course there was some Leela involved and a lesson from Baba in patience. We were told that Baba was in Chicago, delayed due to the busy Holiday season. On Friday December 23rd, Harry felt a strong pull to call Customs in Dayton Ohio. They told him, "yes your freight is here and has been for several days"...Baba was only an hour away and had been for days! Unfortunately they were closing early due to the Holiday weekend so we had to "patiently" wait until December 26th to meet our beautiful Baba. December 26th was a beautiful sunny day. We had to clear Baba through a very suspicious Customs Agent. 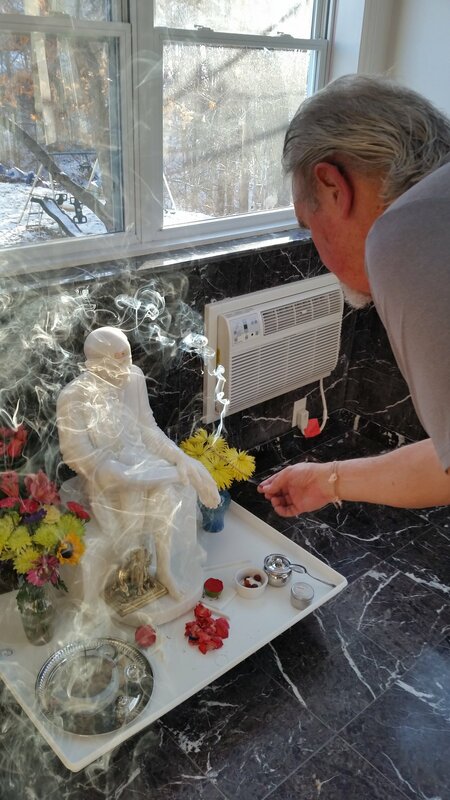 He had many questions and in my nervousness, I blurted out, "it is a religious statue". I thought it was a mistake for sure but he looked up, smiled and said, "oh, ok" and proceeded to get all the paperwork in order. The forklift driver was very concerned about getting Baba into the back of our SUV, but Harry had a plan and it all went smoothly. The hour drive back with Baba was surreal, now the task of getting 257 pound Baba out of the back of an SUV without a forklift; Harry had a plan and with Baba's grace it all went smoothly. As we were working on getting Baba up the 2 steps into our house, I noticed a huge flock of birds flying from the East, directly over the room that Baba would be in. I stopped to give thanks for the blessing and noticed that there was no end to the stream of birds. This blessing of the birds continued for at least 12 minutes, maybe longer as we could no longer see in the darkness. There were so many miracles that happened that day, and continue to happen. Having Baba in our home is a great blessing. We have always loved Baba, but every Aarathi, every Abishek, every chance just to be in Baba's presence, our love and gratitude for him grows. Thank you Baba for coming ~ thank you Christmas Tree.